I’ve Lost My Marbles Painting Marbles! I needed a new french manicure idea so I decided on a marble look, you know, like that bag of marbles you had when you were a kid. Now let me just say, I usually freehand my french manicures, but with all the dots, I had to use tip guides. A) I NEVER can get them straight and B) I still have to fix the lines anyway because I always have seepage!! They took forever and if you do this, you might as well freehand it to save yourself the time. You get both hands because when I pulled the guide off of my thumb, It “schmeared” the colors together, which, for a different look, would be very cool. Also, the staining isn’t visible pretty much at ALL in person, but my camera picks up reds too well and well, you see what I mean…… I’m not used to getting polish on my cuticles so I really had no idea on how to remove the stains. I gave up. There. I said it! For this Manicure, I used one coat of OPI’s Natural Nail Base Coat, generic nail tip guides, Sally Hansen Lavender Cloud for white, OPI’s The It Color for yellow, Maybelline’s Plum Intense for purple, Milani’s Neon Fresh Teal for the green, Orly’s La Playa for the blue, Sally Hansen’s Rapid Red for the red, and OPI’s Chop-Sticking to My Story for the orange. I topped with one coat seche vite, waited for it to dry, peeled the guides off and did two more coats of Seche Vite top coat. Ideally, I would have cleaned up all of the fingers to a straight line, but I guess I just didn’t care- the nail guides were a bit too arched for me but its just something I learned for next time! PS- this was fun, but took over two hours, so do this manicure if you need something to keep you occupied for a while!! Also, my nails aren’t all the same length (the tips of the longest tend to peel just a little and I have to file them down :-( ) so it doesn’t look as cool as if your tips were all the same length. Just have fun with it! 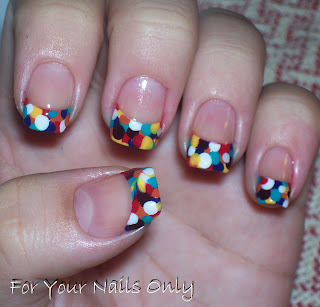 This entry was posted in Nail Art and tagged black, blue, creme, green, Maybelline, Milani, OPI, orange, Orly, red, Sally Hansen, Seche Vite, white, yellow by Tara. Bookmark the permalink. That's so cute. 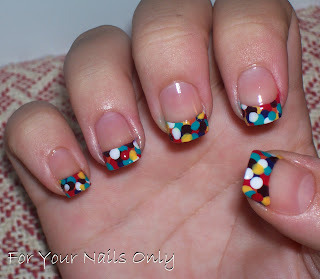 No worries perfection is boring anyway :P. I love the layered look of all the dots. I can see why that took 2 hours! glad you like it! thanks for following me :-) hope you like new designs in the future too!